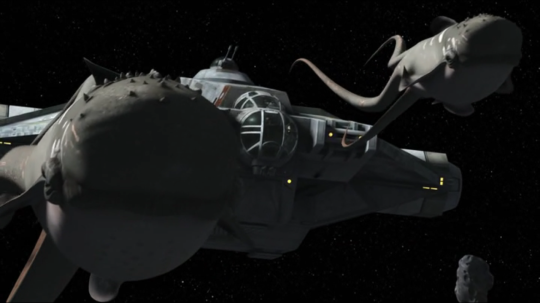 “The Call” is not a serialized episode with only the slight touch of reference toward stealing fuel for other rebel ships. The Empire is negligibly referenced with the antagonists played by the equivalent of a boss on a deep sea oil drig, who refines a gaseous mineral into fuel for the Empire. There are TIE fighters, but they are painted yellow and possess modified solar arrays/panels. There is the storm trooper helmet that Kanan still owns due to the events in “A Princess on Lothal,” but even it is painted by Sabine to resemble something that exceeds the mandatory white specs. If anything, “The Call” has much more in common with the trope of space whales. 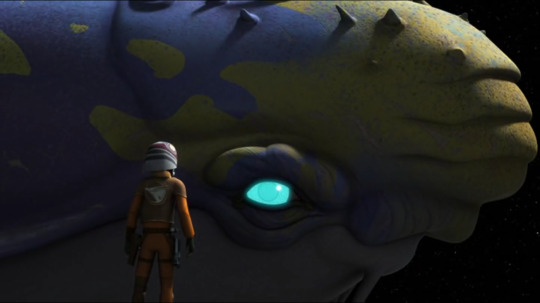 Whale-like creatures roaming the harsh environment of space have long been a favorite accessory to many a science fiction show, and it appears that the Star Wars universe finally succumbed to the phenomenon, which has appeared from Titan A.E. to Star Trek. The songs of whales carry an additional emotional wallop, particularly for viewers who recall the popular “Save the Whales” campaign of the 1980s. It’s not a coincidence that Star Trek IV: The Voyage Home included a dangerous alien space probe which emitted whale songs and threatened to destroy Earth if the crew of the Enterprise could not travel back in time to save a humpback whale to bring to the future-present to communicate with it. Does this mean that “The Call” is a terrible episode? No, not in the least, but it exists as an outlier to Season 2’s otherwise much more interesting episodes because of its failure to be about something other than space whales. One could view the episode as an execution of principles, be it framing, directing and animation. Everything is done well in “The Call,” it simply is not done in a way to generate a lot of interest. Great execution, but very little substance, resulting in a mediocre offering would be a fair way to put it. If the episode had come out in 1986, it would have been a hit. The plot of “The Call” is straight forward. The Ghost is sipping fumes and her crew’s best chance to not become one more derelict floating through space is to find a fuel refinery located in an asteroid field and steal a shipment of fuel meant for the Empire. On their way to finding the refinery, they encounter purgills, who look something like a sperm whale with squid tentacles instead of a giant tail or other fins. They sing like whales and somehow maneuver through space, like water, moving their tentacles around in a squid or octopus-like manner. 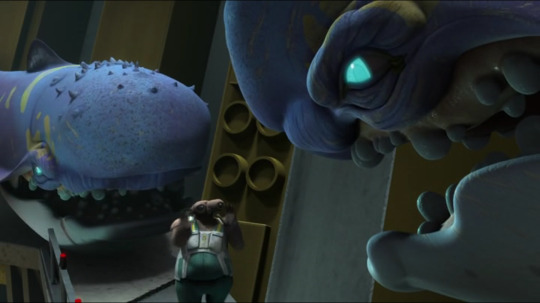 In a weak attempt to provide some characterization, Hera is shown as annoyed by the creatures, if not a bit hostile due to the trouble they make by traveling through shipping lanes. This is a view she will later change, hence offering the idea that she’s grown as a character. Ezra, though, is amazed by the purgill and perhaps, reaching out with the Force, has the instinct to tell Hera to follow them. They lead the Ghost straight to the refinery, where our team of rebels stage a quick and crude assault to steal the fuel shipment being prepared for the Imperials. The workers of the refinery attempt to fight back, but do something of a poor job, and in the midst of this mission, Ezra falls into a cloud of gas (the chemical being refined, existing like a vast lake next to the refinery) and into the proverbial lap of the biggest of the purgills. Remember every television show or movie in which a close up of a whale’s eye is intended to convey their intelligence and invoke compassion? That happens here with a slight twist, as Ezra stares into the eye of the great purgill and see’s what appears to be a reflection of hyperspace in it. The gas, we quickly learn is the fuel the purgills need to enter hyperspace and travel the stars. It’s high octane krill to put it another way. The refinery crew are defeated and the boss in charge is served up a Captain Ahab (see what they did there?) fate of being dragged out of sight into the cloud of gas, presumably to his death. The fact that a third party with a contract with the Empire are treated as villains to be killed and attacked is kind of ignored, despite the implications, because we are shown early on that they view the purgills as useful only as target practice as annoying pests. Fuel in hand, though, our heroes have won the day and Ezra has won over Hera concerning the perspective with which to view the space whales. Said space whales, or purgills as we should address them, having had their fill of the gas/fuel fly into formation with their tentacles suddenly streaming multiple colors, very and granted, creatively, similar to the bioluminescence of sea creatures before winking off into hyperspace. To display Hera’s new found respect and understanding of the purgill, Hera borrows Ezra’s earlier request and states, “Let’s follow the purgills!” End episode. 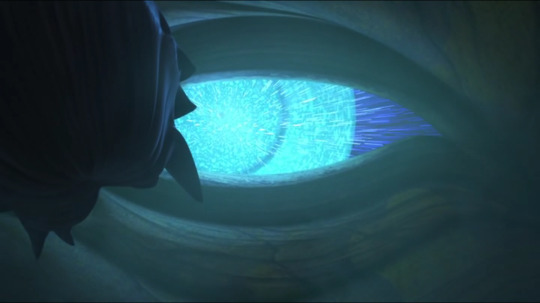 “The Call” may be the closest thing to an after school special that Rebels may ever do, if one can grasp the allegory being told. Again, it isn’t a bad episode, but it isn’t a great one, either. Given the level of quality of most of the Season Two episodes, it suffers from paling by comparison. One might wonder if it was a script originally intended for Season One, which was a bit weaker than the current or if someone simply was told to pitch an idea to serve as a filler episode before darker events begin to fill the screen. 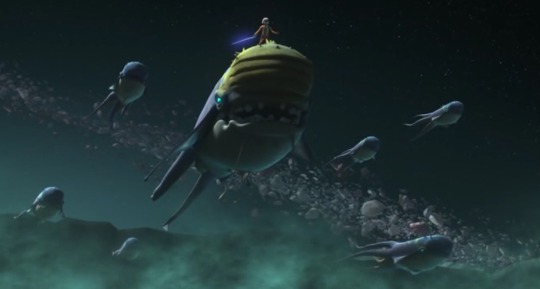 Ultimately, burdened by the space whale association, “The Call,” ends up being a forgettable episode that entertains the viewer, but just barely. We do get to enjoy watching Ezra ride a purgill with his lightsaber activated like a giant surfboard. All right, that might not be a selling point. This is the part where we conclude with a whale pun or joke, but that might simply be too much of a breach of good taste.